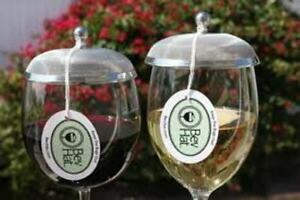 Wine Glass Cover Couples Pack (One 2-Pack / 2 BevHats Total). Keep The Bugs Out! Details about Stainless Steel Wine Glass Cover. 2-Pack / 2 Total.KEEP THE BUGS OUT!! Stainless Steel Wine Glass Cover. 2-Pack / 2 Total.KEEP THE BUGS OUT! !